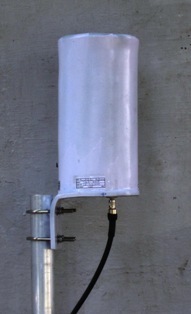 Quadrifilar Helix Antenna for Weather Satellite Atmospheric Research purpose provides horizon to horizon coverage. Quadrifilar Helix Antenna uses a self facing design and is a full wave Helix for perfect RHCP/LHCP, circularly polarized, suitable for a Pole-Mount. The Helix uses copper tubing for filar windings and the low VSWR below 1:1.5 provide perfect matching and increased antenna efficiency with the peak gain of 5 dBi. Filars are held symetrical to the vertical axis to maintain purity of the radiation.